Avelino Vieira could be a key man for Peterborough Sports at Kettering. Peterborough Sports face another tough cup examination when travelling to Kettering Town for a Northants FA Hillier Cup quarter-final tonight (November 8, 7.45pm). 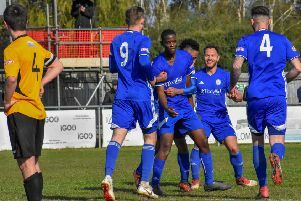 The city side, who itend to apply for promotion to step 4 football next season, have only been outclassed once this season when hosting Stourbridge in an FA Cup tie. Stourbridge are still in the competition. Peterborough Sports star Josh Moreman (blue) is a former Kettering player. Kettering play two divisions higher than Sports and warmed up for this tie with an impressive 7-0 win at St Ives on Saturday (November 5). If Kettering field a strong side, Sports will be hard pushed to get a positive result at Latimer Park. The Poppies play their home games in Burton Latimer these days. Kettering are charging normal matchday admission prices for the fixture so it’s £10 for adults, £6 for concessions and £1 for under 16s. For those unable to get to the game, Poppies TV will be broadcasting. The link is: http://poppiestv.ketteringtownfc.com. The cost to non season ticket holders is £8. Sports stars Josh Moreman and Avelino Vieira are both ex-Poppies. United Counties Premier League side Yaxley also have a big cup quarter-final tonight when hosting Eastern Counties Premier Division side Godmanchester in the Hunts Senior Cup at In2itive Park. The teams have been regular opponents in cup competitions in recent seasons and the ties have always been competitive. Top-flight Wisbech should be too strong for Division One opponents Raunds Town in the United Counties League Cup tonight. Deeping Rangers will move up to fourth place in the Premier Division if they gain their expected win at rock bottom Huntingdon tomorrow (November 9). Deeping are protecting an unbeaten run of 10 matches. Stamford AFC are back in Evo Stik Northern Premier Division One South action tomorrow when hosting Loughborough Dynamo at the Zeeco Stadium. Stamford have seen two player departures since bowing out of the FA Cup at Hartlepool last Sunday. Ryan Robbins has returned to Coalville Town, while Tom Batchelor has returned to Grantham. Holbeach United’s quarter-final of the Lincs Senior Trophy at Boston Town scheduled for tomorrow has been postponed.